Marketing in Magento is something which is increasingly focused on the review section, and the way in which reputation is built from there. Reviews are helpful because they are a completely trustworthy form of management feedback, and also because they do not cost the company any money. Management reviews allow you to have some control over the reviews which are being left on the page, starting with if people leave them or not. Reviews allow customers and potential customers access to feedback on the products which are available via the Magento eCommerce site. The entire process of leaving and reading the reviews is an incredibly easy one, no matter what form it takes. If you want to make things even easier for your customers, then invest in an online form which will allow customers to share their reviews and ideas about the various products without needing any more input. Reviews are commonly trusted more than any other type of feedback due to their nature as the high-tech equivalent of passing on recommendations via word of mouth. Because of this, many sites have entirely automated the process of receiving management reviews. Enabling reviews on a Magento site can mean a number of things – they can be allowed on the site itself through comment sections and feedback forms, or through the use of an extension. As there are a number of different extensions used, and all of them have different ways in which they can be used. Each particular method of reviewing has its own advantages and disadvantages, which means that each one will be useful or not depending on several factors, such as what the retailer hopes to get out of the reviews, how their site operates, and so on. Magento eCommerce services have a number of different extensions for helping customers to write reviews. Choosing the correct extension will again depend on a number of factors. Obviously, people who are asking for reviews will want to make it as easy for people to leave reviews, so they will do well to pick an extension which complements their site, and makes leaving reviews as painless a process as possible. Advanced Reviews – this extension allows clients and customers to leave reviews based on radio buttons to increase or decrease their rating, as well as giving them a list of pros and cons which can be filled in manually. People who are looking at the reviews can sort them based on a variety of factors, and the reviews themselves can be shared via social media. LipScore – this review extension allows for customers and clients to leave the normal reviews, but also to upload pictures and reviews of their purchases to give a more in-depth review. Social media platforms, such as Facebook, are becoming increasingly popular as the place for reviews to be read and written, so any Magento expert will tell you that having a way for reviews to appear on whichever form of social media is the most useful to your own particular site. Make sure that the social media site is able to transition smoothly to the site itself, and vice versa. Perhaps also consider having reviews available in both mediums. The retailer running the Magento site in question can actively put reviews on social media in two ways: either they can themselves set up a Facebook page, and put reviews of products on it, or they can use a review extension which allows clients to put the reviews on social media if they choose, and encourage them to do so. Sending a follow-up email is one of the best ways to ensure that a customer will return to your site another day. It is also useful for when a customer leaves a bad review, as it allows the site to try and smooth things over. Follow-up emails can be handled in a variety of ways, with Magento being capable of creating the emails within itself. 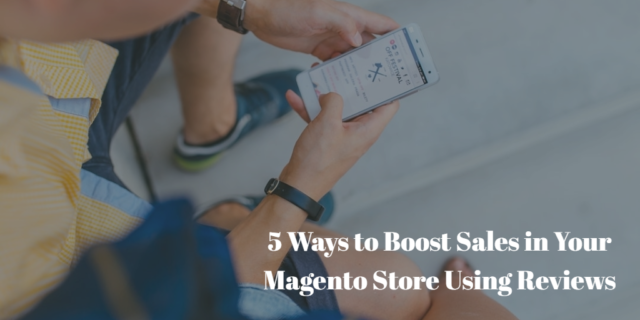 This is useful because Magento can create and save multiple emails within itself. Having multiple emails saved means that the retailer does not have to create an email from scratch every time, and can simply take one of the pre-written emails and rewrite it slightly to fit more easily into the present circumstances. Using Magento to create the emails also serves a useful purpose in that it is the platform itself which saves customer details – the pre-written emails and the saved customer details (assuming that the customer has bought something, of course), allow for less work on the part of the retailer, as it is easy to combine the emails and the appropriate details. Being able to write reviews on the product pages themselves is one way to get reviews written, but it does require people to come back to the original page in order to leave feedback. Reviews are important for building a reputation; make leaving a review as easy and simple as possible, and a number of reviews you have will grow. As we have seen, the number of extensions and platforms which can be used in various ways to help people leave reviews. Since there are so many different types of sites and almost as many ways to leave reviews, it is better to seek out the ways in which reviews can be left and used in a way which makes the most sense for the site under inspection, rather than what makes the most sense to anybody else. Customer comfort is the priority here, as it is the best way to get reviews. The reason for there being so many extensions and add-ons in the process is that, while Magento does have its own review functionality, it is not the most easily navigated, and as a result might have an effect on reviews. Using the extensions means that you can create a much more pleasant experience for the customer, leading to a greater chance of them leaving a review. Amanda Brown is a content creator at WillbeCoded and a passionate blogger. Specializing in working with the Magento platform, she often researches trends in eCommerce and regularly shares articles. Moreover, Amanda is heavily interested in online marketing and history.